Heat oven to 425°F. 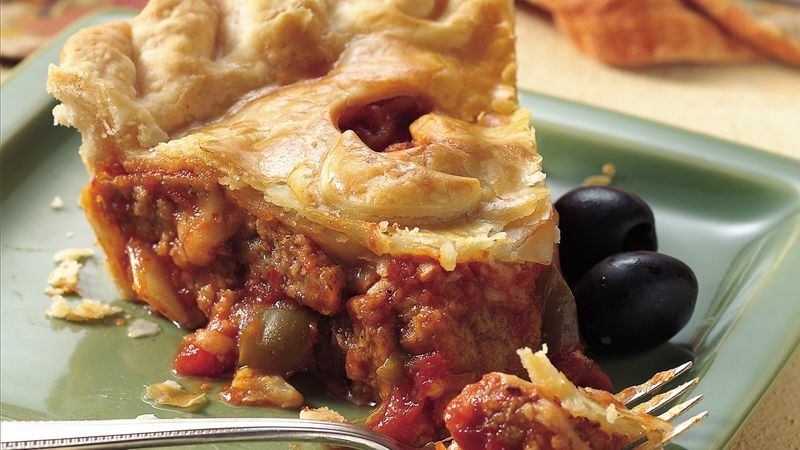 Prepare pie crust as directed on package for two-crust pie using 9-inch glass pie pan. Spray large skillet with nonstick cooking spray. Heat over medium-high heat until hot. Add onion and bell pepper; cook 3 to 4 minutes or until crisp-tender, stirring frequently. Add meatballs, pasta sauce and 3/4 cup of the cheese. Reduce heat to low; simmer 5 minutes or until thoroughly heated, stirring occasionally. Spoon meatball mixture into crust-lined pan. Sprinkle with remaining 3/4 cup cheese. With small Halloween cookie cutters or sharp knife, cut small shapes, such as half moons, from remaining pie crust; reserve shapes. Place cut-out crust on top of pie; seal edges and flute. Brush small shapes with water; attach to top crust. In small bowl, beat egg yolk and 2 teaspoons water until well blended. Brush top crust with egg yolk mixture. Bake at 425°F. for 25 to 35 minutes or until crust is golden brown and filling is bubbly. Cover edge of crust with strips of foil after 15 to 20 minutes of baking to prevent excessive browning. Let stand 10 minutes before serving.